Why all these happy people? This what the set will look like at one point during the show that’s on at Carnegie from Thursday to Saturday this week. 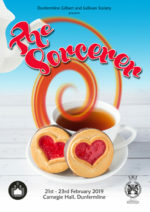 To find out why the villagers of Ploverleigh are happy – and why a key member of the cast has left the set – you’ll have to come to see our production of The Sorcerer. 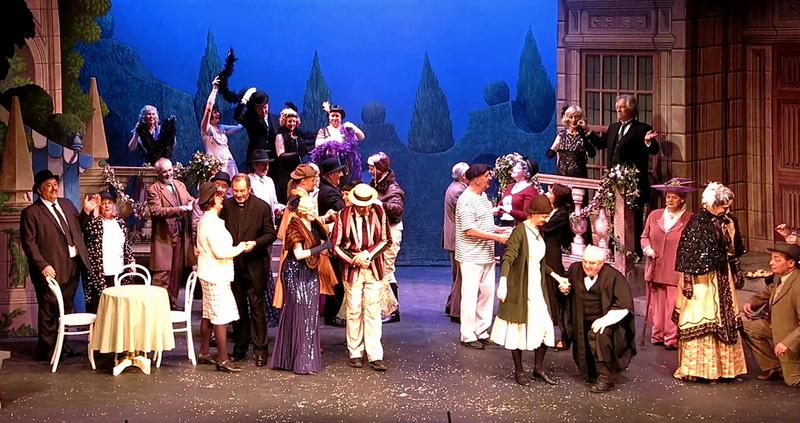 Lots of fun is being had on the stage, accompanied by some splendid singing and playing, and it really would lift your spirits to come and see it. Tickets (£15; £14 concessions; £5 under-16s) are available in advance from the Carnegie Hall Box Office, in person, by phone on 01383 602302, or on-line at this link. Or just come early, and buy your ticket at the door. We guarantee that you’ll not regret it! 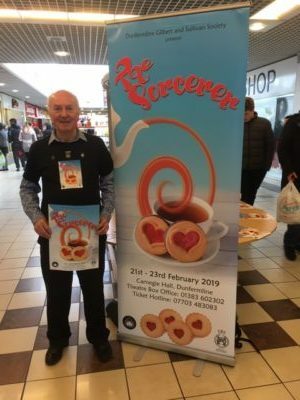 Geoff led a team of publicists at the Kingsgate Centre in Saturday who distributed ‘Sorcerer’ flyers and information to passing shoppers and encouraged them to come along on Thursday to Saturday next week. At our EGM on Wednesday 12 December it was unanimously agreed that our production in 2020 should be HMS Pinafore. What will we be playing in 2021? Well, given The Sorcerer and HMS Pinafore as predecessors, any Savoyard could take a punt at what the 50th anniversary show might be!